Welcome to the "Fall In Love with Giveaways" Giveaway Hop hosted by Heather from Mommy's Favorite Things and Michelle from Mama's Baby Cupcakes. This hop has an open theme, which means anything family friendly is up for grabs! Each blog has a minimum prize package of $25 per winner and after visiting my giveaway, make sure you use the linky below to take a look at the other blogs to see what they have to offer for you! Blankets have always been a love amongst my kids. They need them to keep warm and sleep with, like to snuggle them and drag them around like lovies. Muslin is our particular favorite. 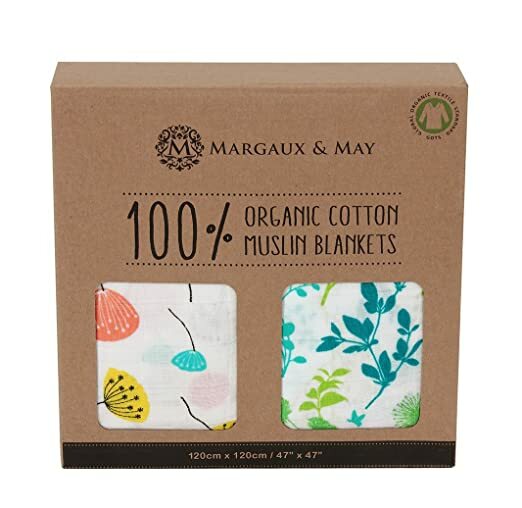 So when Margaux and May asked me to review their blankets, I couldn't wait for them to arrive. I settled on the Fern and Leopard 2pk set! All snuggled in for a nap! As you can see the baby loves the blankets! He likes to sleep with them and he loves to snuggle and cuddle the blankets. They are super soft as musli tends to be and they wash up beautifully. Don't pill or shrink and only get softer with time. I love that these blankets adapt. From swaddling, to snuggling to covering them up for their naps! My 8yr old likes to snuggle muslin blankets still, they are incredibly soft. 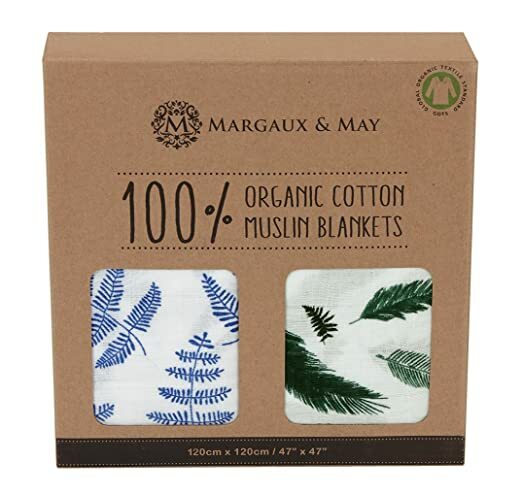 So know you'll get your money's worth when purchasing these blankets as they'll last for YEARS! The blankets measure 47" by 47", are 100% organic, and they protect against overheating. They are breathable and thin, so baby can't easily suffocate and they prevent overheating as well. They come in 3 different patterns. The other 2 seen here! Mama's Baby Cupcakes, Mommy's Favorite Things and the "Fall In Love with Giveaways" participating bloggers are not responsible for sponsors who do not fulfill prize obligations. I choose the "Dandelion" set. I love the Leopard set! I would go with the leopard set! I'd choose dandelion if I won, I love those 2 blankets in that package! I absolutely loved all 3 of these sets but if I have to choose it would be the Dandelion set,so pretty!! I'd pick the Dandelion set. It's adorable! I would choose the Dandelion set. I love the fern leaves and feathers!! I would really like the Dandelion set! I would choose the feathers and ferns. These are so cute! I'd choose the leapord set! I love the leopard set. I would pick the dandelion set! Margaux and May really looks nice. I like the Dandelion and the Leopard sets. They're both really cute, but I think I'd choose the Leopard set. I would choose the leopard set. I'd choose the Leopard set. I like the leopard set. I love all 3 , but I'd choose the fern & feather set! I like the feathers and ferns set. I would choose the fernleaves and feathers set! I would choose the Leopard set. Thanks. I'd chose the Dandelion set -so pretty! I like ferns & feathers set. I would choose the fern and feathers set. id choose the dandelion set! I would pick the Dandelion set. I would love the Dandelion set! I would like the "Dandelion" set. I'd love the Dandelion set! I would like the dandelion set! I think it's called the Margaux-May ferns and feathers. I love the Dandelion set! I love the feather & leaf set! I would love to have the "Dandelion" set. I really like the Leopard set. I like the Dandelion set! !